CAP is famous for making gym equipment for commercial fitness facilities and individual home owned garage gyms to fill out a large retail space with trusted and certified equipment. 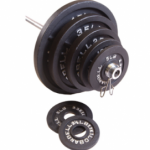 Though, CAP Barbell is mostly recognized for producing strength training equipment in which the manufacturing of one inch or two inch plates isalso included, along with barbells, kettle bells, dumbbells, squat stand and many storage accessories. CAP barbell is renowned for creating many different barbells with great quality and extensive features in the past. The new Beat Bar is one of CAP barbells production that consists of nearly the same features and specs with theexception of having a new Accu-coat coating. This new coating gives a very special type of finish which out stands other coated barbells in the market. They are manufactured to give extensive durability in a very good value of money. 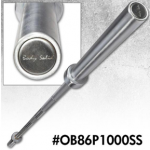 The bar also has many positive feedbacks and reviews on different sites like Amazon, Walmart and EBay, making it a very popular barbell in gym equipment market. The Beast Bar comes in a very budget friendly price with extensive features, making this barbell compatible for everyday use. 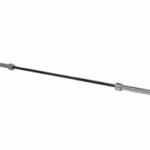 The Beast Bar has a weight of 20 kg and contains capability to withstand weight up to 1000 pounds. The bar is constructed with pure steel while having anaccu-coat finish. You can choose your preferred color for accu-coat finish. The length of the barbell is 2200mm in which the shaft length is 1310mm. It comes with dual knurl mark according to IWF and IPF standards with no center knurl supported. The design of the sleeves is a snap clip one. The Beast Bar is constructed and coated in USA and comes with a three-year manufacturer warranty. 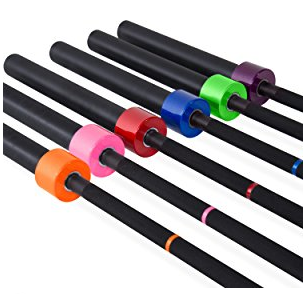 After gaining immense reputation in the gym equipment market, CAP Barbell introduced itsspecial type of barbells that are customized through color coating weightlifting bars. The specification and features of these bars are nearly the same as CAP’s standard bar, but with additive special type of Accu-coating. The coating done on theBeast Bars isof high quality and gives superior performance and extensive durability making itrust resistant. The different colors make you very easy to select a barbell of your choice which gives you an appealing and comfortable feel. The bars are easy to maintain and clean to increase their life span. Hence, making these bars available for commercial gym and home gym use. The additive accu-coating is a special type of coating that prevents the bar from getting rust and corrosion by working as an armor on the barbell. With accu-coating there is also a standard chrome coat available, that works the same as accu-coat. The coating is further initialized with a three step coat process in which the colored coat of blue, red, purple and pink barbell is facilitated by a UV stable acrylic coat which takes the protection and design of the Beast Bar to a new level. There is a thing to note that every bar consists the of same durability, except of green and orange coated bar which have a matt finish. The Beast Bars are available in a length of 2200mm in which the inside length from the collar to next one is 1310mm. The diameter of the shaft is kept very standard which is 28mm, and can accommodate many different weight plates. The material of the bar is kept pure steel that can handle any wear and tear of regular gym abuse. The sleeves are constructed with snap clip design that ensures the plates are in place and doesn’t clang while lifting. 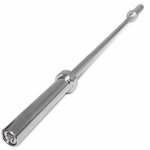 The knurling done on the barbell is kept very moderate and is also known as diamond knurl. The bar is very comfortable and easy to stick in your hands tightly which will let you perform high intensity workout very securely. 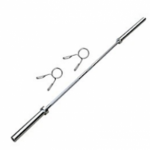 The bar consists of dual knurl marks which are with respect to IWF and IPF standards and have no center knurl. Though the bar might be a bit clingy for professional weight lifters who prefer more of an aggressive type knurl. No matter how sturdy the construction is, it is still recommended to properly maintain and clean the barbell, to make it look fresh for longer period of time. For that, CAP Barbell suggested you to light coat the barbell with WD-40 or three in oil. 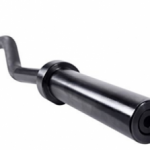 The Beast Bar is backed with three years’ manufacturer warranty against bending or breaking. The company follows a policy to fully replace the barbell or that specified part which is having an issue. You can see how CAP Barbell is backing its product by providing exceptionally well customer service and being responsive towards user queries, complains and feedbacks. The bar hasa weight of 20 kg. The bar hasthe ability to withstand weight up to 1000 pounds. The bar is 2200 mm long on which the shaft length is 1310 mm. Consists of accu-coat which provides a variety of different colored bars, and prevents the bar from rust and corrosion. The material used in the construction of barbell is pure steel. The design of the sleeves is of snap clip. Consists of dual knurl marks which are of IWF and IPF standard. Moderate depth diamond knurl is done which properly fits in your hand. The tensile strength of the barbell is 130,000. The barbell comes with a three year manufacturer warranty. In my opinion, the CAP Barbell comes with a very new invention of accu-coat and three layered protections by producing its new product, the Beast Bar. I purchased this barbell looking towards its design and look, while also having some new cool features like accu-coat, three layered coating and comfortable knurls. The barbell came on my doorstep within three days and was in a very good packaging. The sturdy box kept the barbell in good shape and the finish on it looked very fresh. I ordered the bar having a blue colored finish, which I will say was very eye-warming. When it comes to performance, the barbell produced a very repetitive spin due to the brass bushings which were constructed very well. Having a low tensile strength made the bar much more whipper and it was very easy to perform cleans on it. The dual knurl IPF marks adjusted on my hands immensely well without damaging my hand texture. The only issue I faced was having no center knurl, which prevented me to perform squat in this beautiful piece of equipment. Tensile strength of 130,000 makes this barbell much whipper. Weight capacity of 1000 pounds is very massive and fits perfectly well for beginners to professional weight lifters. The three layer coat gives an immense protection towards the barbell. Accu-coat lets you choose your barbell in desirable color. The dual knurl marks let you properly adjust your hands on the shaft. The Beast Bar is a bit expensive than CAP barbell’s standard bar. Professional weightlifters might not prefer this bar because of medium depth knurling. The brass bushing doesn’t give a proper spin in heavier weight. The bar is not really recommended to perform squats because of extensive whip.